Never heard of navratan korma? Nine gems (“navratan”) includes lots of brightly colored vegetables—er, nine, to be exact—simmered with garlic, ginger, onions, cream, yogurt, cashews, and raisins. It’s a spectacular vegetarian dish that will definitely satisfy your Indian craving. Whether you keep it mild and sweet or add some hot peppers and cayenne for kick, make it your own and take vegetarian cooking to the next level of “yum.” Not an everyday affair, it’s a labor of love that takes some time but is lots of fun, very rewarding, and will definitely show someone you care. And it’s okay if that person is you, too: you deserve it. 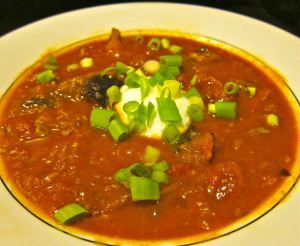 I cook a lot of Indian food, like baingan bharta, roasted eggplant soup, and aloo gobe, for starters. It’s not just because my husband is Indian, either. We both love dishes with big flavors, and Indian food, ike many other ethnic cuisines, definitely fits the bill. I had been having quite a craving and decided to try something new this past weekend. The timing was perfect, as the autumn harvest is in its glory and all of the produce above, including the garlic and ginger, came from my local farmers’ market. 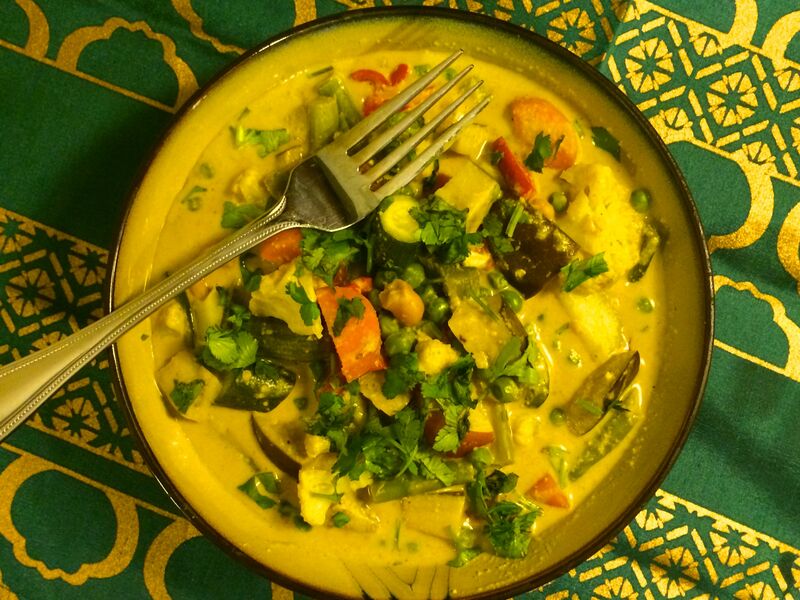 If you’re not familiar with this dish, you can learn more here: Wikipedia helpfully reminds us that this is a recipe for “korma,” not “karma.” Too bad, because I’d love a recipe to make a big batch of good karma. Anyway, as I’d never made this dish before, I scoped out a few recipes online and ultimately made my own version taking a bit from each, using Sanjeev Kapoor’s recipe as a starting point and modifying it as discussed below. I can’t tell you how many times I counted to make sure there were in fact nine different vegetables. Carrot was my ninth, but I just used one because my husband has issues with cooked carrots. The nine gems don’t need to be only vegetables, anyway, and may include cashews and raisins among the goodies. You get the idea. Blanch the vegetables and set them aside until they’re later added to the sauce (often referred to as “gravy” in Indian cooking). Blanching is simply boiling briefly then dunking in cold water to stop the cooking; this also retains the color of the vegetables. I don’t regularly boil vegetables (other than corn-on-the-cob), as it leads to nutrient losses. Indeed, the blanching liquid was mildly colored from the water-soluble phytonutrients and vitamins that had leached into the water. Sounding like a quick vegetable stock, yes? Bonus: no need to waste water! Some of it was used in place of the water called for later in the recipe, and the rest went into the fridge for a future soup. While the vegetables are cooking, prepare the various pastes. I won’t lie, I found the number of “pastes” required daunting. Perhaps if they’re sitting in your fridge, or you buy them from the Indian store, you’ll be all set. As I was making everything from scratch, I decided to cut a few corners. My online research and comments from other cooks suggested that the cashew paste was key, as was the onion paste. And, once I get out the food processor these things whir right along (pun obviously intended). I followed Sanjeev’s basic recipe for the cashew paste but added water and a bit of almond and peanut butter to make a larger supply in case I needed it. (I did.) Lovely. I improvised my onion paste by processing finely an entire onion with water then simmering it on the stove while the rest of the recipe came together. I believed the reviews that this step is critical in flavoring the gravy: the boiled onion paste is one of the major liquids in the dish, and chopped onions will certainly not achieve the same effect. I did, however, decide to blow off the garlic and ginger pastes and instead employed several cloves of crushed garlic and an inch of grated ginger root; I felt very okay about it. I reiterate that this dish is a true labor of love if you are making it homemade and don’t have the pastes previously prepared or from the pantry. In other words, Sanjeev’s time estimation is way, way off. If you love to spend time in the kitchen, you’ll find it an outstanding opportunity to indulge in a little cooking meditation, jam to your favorite tunes, or sip on a glass or two of wine. There’s peeling, chopping, blanching, simmering, smashing, grating, processing, boiling, reducing, and mixing for a good hour, after all, and that doesn’t include the extra 20 minutes it took me to figure out “what else does this need?” As well, while this dinner did take a while to prepare, a container went into the freezer for another meal, some stayed in the fridge for a lunch for my husband, and I’m one step closer to making my next soup. When you think about it from that perspective, the time invested more than pays off. And I had a wonderful Sunday evening. This recipe looks great. However, I didn’t see you using any turmerik or curry…What makes your korma looks this yellow creamy color? Is there a way for you to make step by step the preparation process? Thank you! Thanks very much. I can’t wait until I take this out of the freezer for another meal! 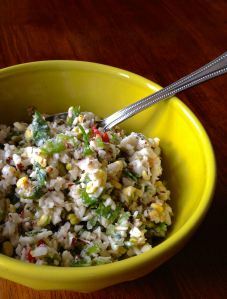 I provide a link to the recipe, which has more instructions for you to follow if you need more detail than I provided. 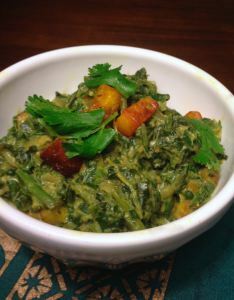 (I did use some turmeric and a few other classic Indian spices, you’ll note in the post.) Good luck! Hello, I can’t seem to find the actual recipe. Would love to make this for my family. Please advise.